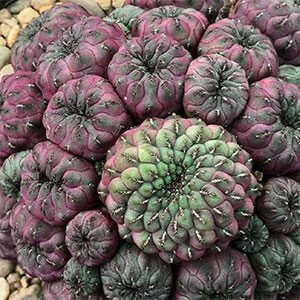 One of the more unusual succulents, Sulcorebutia rauschii is from Bolivia and it is a mound forming or clustering succulent. Like many succulents it will change colour depending on the season and growing conditions. Generally best described as a rosy red flushed with green. It will flower, with bright violet red flowers appearing in numbers in spring. The cool winter is required to promote the formation of the flower buds. Sulcorebutia rauschii requires good drainage and for flowering and good colour it does need a cool dry winter. Not frosts and freezes however still cool. Typically it needs to have the growing medium dry out between waterings, and the plants roots should never be allowed to sit in water. Repotting regular is important for good growth. Late winter is a good time to repot, just before the flower buds begin to form. It is suggested that the top layer of the potting mix be a medium gravel, this lifts the foliage and helps prevent rot. As new growth commences in spring a little mist spraying can be beneficial. The main problems are caused by wet soils and a combination of wet soils and cold temperatures can be fatal to these wonderful plants. Usually propagated by division or from cuttings.